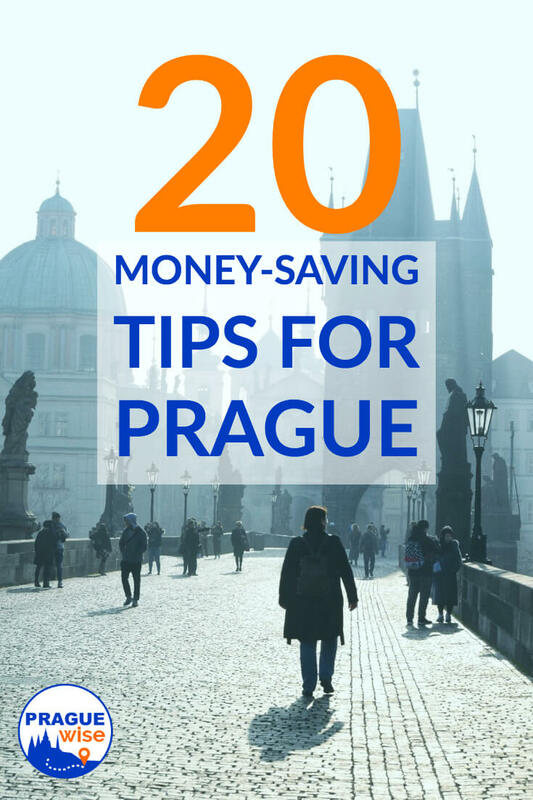 A Prague pension can be just as comfortable and affordable as any hotel in Prague. Choose the right one, and you won't want to leave. We've chosen these based on 3 main criteria: location, low rates and excellent atmosphere. They are all central, which means you can walk to all sights. They have reasonable rates - around $120 per night and they offer breakfast. This Prague pension combines charming atmosphere, service and location. Housed in a 17th century building, the House at the Boot combines Old Prague perfectly with our contemporary lives. The rooms are furnished carefully, combining antiques with modern furnishings. House at the Boot offers single and double rooms with shared or private facilities. You can also reserve a larger suite with bedroom and living room. The location is also just perfect. It's in a quiet area away from crowds but close to everything - just across from the impressive German Embassy and Petřin Park is just up the street. 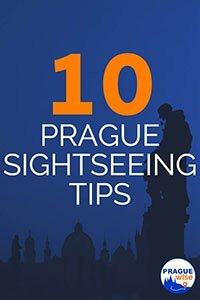 Charles Bridge and Prague Castle are both a short walk away. I highly recommend just wandering the little streets nearby. Most visitors completely overlook these charming areas. Check prices and reviews on Trip Advisor. Address: Vlašská 30/333, 118 00, Prague 1, Malá Strana (Little Quarter). This charming little Prague pension combines a relaxing environment with a great location. It's lovely sunny rooms are just steps from Charles Bridge and Old Town Square. Check map and reviews. The Green Garland has 6 double rooms and 3 triple rooms. The double rooms are large enough to accommodate 3 people. 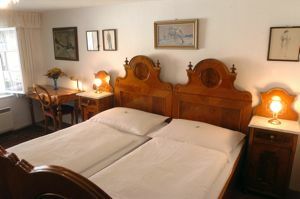 And, the triple rooms are great for families with children. They share a kitchenette for self-catering. The historical building dates from 1357 and has great ambiance. The rooms are located on the first and second floors (no lift). Common areas include a lounge and breakfast room with wonderful arched ceilings. Breakfast is included in the room rate. The Green Garland also includes a cozy restaurant with a laid back atmosphere. Even if you don't stay here, we recommend checking out their menu. Address: Retezová 10, 110 00, Prague 1, Staré Město (Old Town). This Prague pension makes our list simply based on its location. Okay, its comfortable and affordable too - but the location is ideal. Check rates and reviews. 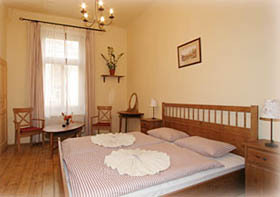 Pension U Lilie is a few steps from Charles Bridge, the Royal Route and Old Town Square. You won't need public transportation to go anywhere - just bring your walking shoes! This family owned pension has 15 rooms and 2 suites. The rooms are modest but very comfortable. I would recommend these rooms particularly for couples and single travelers. If you want a good comfy room but nothing fancy, then this is the place. Each room has a telephone, satellite TV, minibar and private bathroom. And, these range from small single rooms to larger suites. The suites are great for adding an extra bed for a family or group. The pension also includes a full restaurant with reasonable prices for good Czech food and beer. Address: Liliová 15, 110 00, Prague 1, Stare Mesto (Old Town). It's very close to Charles Bridge and Old Town Square. Great shopping and dining nearby. Metro: Narodní Třída or Staroměstka. Now for something different! 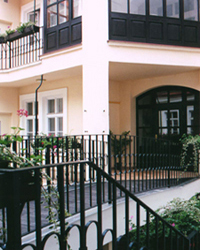 The Dahlia Inn could be considered a boutique hotel, Inn or Prague Pension. Whatever label you use, it's a breath of modern fresh air. And, it's cheap! Just check the rates. Of course, we love the old charm of Prague, but this Prague pension is where Prague is headed. It's not far from the lively Wenceslas Square and has good transportation connections. The Dahlia has all the comfort elements you're looking for. 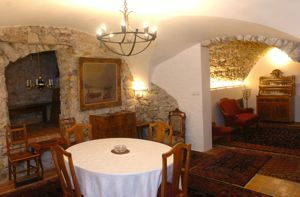 It's a newly renovated residence with lovely single, double and triple rooms. Each room has an arty flavor with tiled bathrooms and great big comfy beds. And, each room also has satellite TV and free WiFi. Best of all might be the price. If you don't mind staying just outside the historical centre, then save money and stay here. This Prague pension won't disappoint you. Address: Lípová 1444/20, 120 00, Praha 2, Nové Město (New Town). Close to Wenceslas Square and Old Town. Metro: Muzeum. The Merlin offers a variety of eclectic, comfortable rooms near the Vltava River. You can choose between big double and triple rooms with private bathrooms or cheaper rooms with a shared bathroom. They have lovely single rooms too. We particularly like the exposed wooden beams and brick walls of the upper rooms. There's no elevator, but it's worth the walk up. And, there are lovely views of Hradčany and Prague Castle. 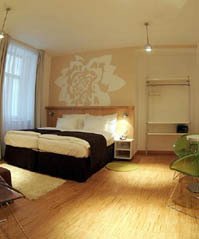 Located just down the river from the National Theatre, the Merlin is quiet and central Prague pension. There are great tram and metro connections and you can walk easily to Old Town and Wenceslas Square from here. Breakfast is not included in the price but can be ordered the day before. It's served in the relaxing medieval restaurant downstairs. Of course, the restaurant is open for lunch and dinner too. It's a great place to grab a beer and hang out after a day of walking. Address: Gorazdova 22, 120 00, Praha 2, Nové Město (New Town). The Merlin is not far from Old Town, National Theatre and Wenceslas Square. It's a very friendly pension with a feeling of home. Metro: Karlovo Naměsti. 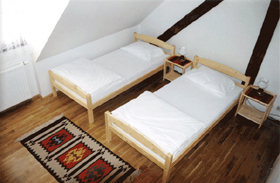 In Czech, a pension can also be considered an inn or B&B. So if you don't find a pension by name, consider other categories which offer similar styles, prices and atmosphere. Prague is filled with similar properties. They may come under names like Residence, Inn or Bed and Breakfast.